The ability to manage change-management processes depends on individual skills and organisational culture. These skills have to be increased and practiced; in this perspective, the reading and analysis of this casebook can generate mental training about innovation. In order to look for common problems and solutions for implementing managerial development, a rich portfolio of European cases, with at least one representative for every European component, is presented. Typically comparative works select different countries according to criteria such as English speaking, countries from the same region or industrialised countries. This book looks at comparative differences but also has sufficient cultural, social, political and economic homogeneity. Comparisons are more useful and easier to understand due to common implementation difficulties and possible change strategies. A general introduction leads on to some theoretical background, which presents the Editors’ thinking about strategy, change management and the strategic approach to change management, representing the framework at the core of the book. A guide through the European examples introduces the cases themselves. Teaching notes on how to position the case, learning objectives, question discussion, case analysis and further reference are provided in order to show teachers and trainers how to use each individual case. This book is a tool for discussion and a framework to structure a debate about the evaluation of managerial evolution, providing trainers, students and practitioners with an instrument to understand how to face the difficulties each change management process is affected by. Francesco Longo is Associate Professor at the Public Management and Health Care Department of the Bocconi University, Italy. He is also the Director of the Research Center in Health Care Management of the Bocconi University. His research interests include health care management, public service provision, network and governance. He has written a number of books and articles about public management and health care management. Daniela Cristofoli has a PhD in Business Administration and Management at Bocconi University, Italy, and is research fellow at the Public Management and Health Care Department of the Bocconi University. Her research interests include strategy, corporate governance and stakeholder management both in public and private sectors. 1. 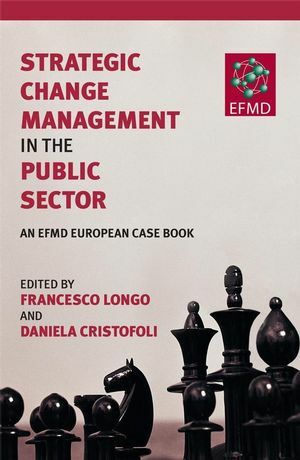 MANAGING PUBLIC REFORMS EFFECTIVELY: A STRATEGIC CHANGE MANAGEMENT APPROACH (Francesco Longo). A classification of public reforms and change management. Features of public reforms and change processes. The role of the organisational structure and the managerial tools in reforms and change process. A comprehensive strategic approach to designing and implementing reforms and managing change. How to design and manage a process of change. 2. A GUIDE THROUGH THE CASE BOOK (Daniela Cristofoli and Francesco Longo). 3. THE BRUSSELS PORT AUTHORITY’S CONTAINER TERMINAL: THE UPS AND DOWNS OF PUBLIC–PRIVATE PARTNERSHIPS (Jan Mattijs). Operating the container terminal: from start-up to failure . . . and restart. HOSPITALS (Ruth Sepper and Ruth Alas). The North Estonia Regional Hospital. The NERH formal reform processes. The change management processes in terms of strategic objectives, actions and results. Gap between the planned and implemented strategic change. How to make the strategic change successful. 5. LOLF AND CHANGES IN THE FRENCH PUBLIC SECTOR: THE CASE OF THE PAUL CÉZANNE UNIVERSITY –AIX-MARSEILLE III (Robert Fouchet and Emil Ture). UPCAM’s organisation at the outset of LOLF reforms. A historical account of UPCAM’s external governance relations. Anticipated effects of LOLF regulations over the public sector links. Expected changes in UPCAM’s management. 6. POLITICAL AND MANAGERIAL CHANGE IN THE CITY OF COESFELD (Harald Plamper and Ingrid Beutel-Menzel). The reform goals and processes. The results of the reform programmes. How to manage the future? 7. IMPLEMENTING EQUAL IN MEGARA MUNICIPALITY (Joyce Liddle and Ioannis Oikonomopoulos). Greece and the European dimension. Lessons learned from prior EU Programmes and transfer into EQUAL. Megara’s involvement in the EQUAL Programme. Outputs of the EQUAL Programme. 8 CHANGE MANAGEMENT PROCESS IN THE CITY OF AMERSFOORT (Piet Severijnen and Job van de Bovenkamp Ba). Local government in the Netherlands. How to successfully restructure an internal department. The change process and the department reorganization. 9. MILAN MUNICIPALITY AND THE GOVERNANCE OF MUNICIPAL ENTERPRISES (Daniela Cristofoli and Francesco Longo). Providing Milan’s citizens with public services: Milan Municipality and the municipal companies. Ensuring the satisfaction of public needs: instruments for controlling municipal companies. Controlling the municipal companies: what is Milan Municipality’s outlook? Sports Associations and the Olympic Games. Contracting Out: A model for managing sports facilities. Sports Area, districts and management organizations. Types of management organizations: selected examples. The advantages of indirect management. 11. MANAGEMENT BY RESULTS: ITS WAY FROM IDEA TO DOGMA IN THE CASE OF SWEDEN (Göran Sundström). What is Management by Results. Management by Results in Sweden: the story. 12. MUNICIPALITY OF BAAR: SPEYER AWARD FOR LOCAL GOVERNANCE (Albert Hofmeister and Jürg Dübendorfer). Pillars of the Swiss system. New initiatives and instruments for better public management. New initiatives and instruments for the collaboration with citizens. Result: Speyer Award for local governance. Next steps: “in order to remain good you have to improve continuously”. OF THE LONDON BOROUGH OF LEWISHAM (Paul Joyce). The emergence of the system (1994–2005). Conditions influencing the development of performance management – political management. The effects of performance management in Lewisham Council. Making performance management work in government organization.